What's The Science Behind Genomics? 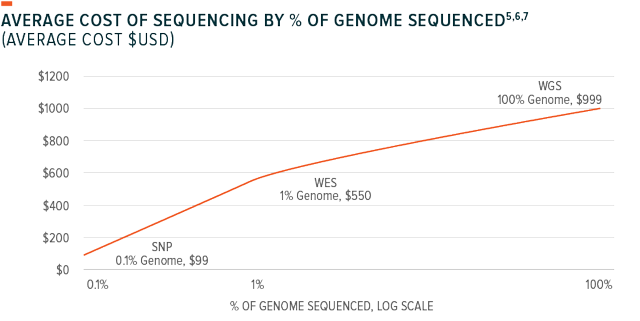 By sequencing a small, yet significant portion of one’s DNA, SNP genotyping checks for common genetic variants at a reduced cost. Computational genomics and genetic diagnostics: uses computational and statistical analysis to decipher biological insights from genome sequences and related data. Development and testing of genetic medicines and therapies seeks to detect, cure or treat diseases by identifying or modifying an organism’s gene expression or functioning. On April 9, 2019, we listed the Global X Genomics & Biotechnology ETF (NASDAQ:GNOM) on Nasdaq. This blog post is the second in a two-part series exploring the disruptive impact of genomics on healthcare and medicine. To read the first part, which focuses on the catalysts supporting genomics’ emergence as a powerful theme, click here. Genome sequencing: is the process of determining the exact order of one’s DNA. Estimates suggest that the global DNA sequencing market was valued at $6.2 billion in 2017 and is expected to reach $25.5 billion in 2025, with a compound annual growth rate (CAGR) of 19%.1 There are currently three common sequencing types available: SNP genotyping, whole exome sequencing (WES), and whole genome sequencing (WGS). Computational genomics and genetic diagnostics: uses computational and statistical analysis to decipher biological insights from genome sequences and related data. The global computational biology market is expected to value $6.8 billion in 2024, up from $2.3 billion today with a CAGR of 19.5%.8 Among the primary benefits of computational genomics is improved understanding of gene expression, protein signaling pathways and their role in complex diseases such as diabetes, cardiovascular disease, Alzheimer’s and cancer. With increased volume of genetic data, data sharing, and improved reliability and validity of statistical models, computational genomics should help identify new treatment entry points and improve understanding of individual risk factors. For example, researchers are “letting loose” machine learning algorithms and neural networks on patient data to identify the underlying causes of addiction or dementia, or determining what genes, or combination of genes, fuel disease progression. In addition to the focus on humans, gene analytics have massive implications for other industries like agriculture and food & beverage. In agriculture for instance, computational genomics could improve crop diversity and resistance to climate change and other environmental pressures. Restaurants may even one day soon begin customizing dining experiences based on your ‘taste’ genes. Gene editing: inserts, deletes or replaces DNA at a specific site in the genome of an organism. While gene editing is often categorized as an extension of gene therapy, gene editing focuses on directly changing an individual’s DNA in the afflicted location, whereas gene therapy may use treatment options that affect gene expression pathways but do not alter DNA. Both types of solutions should complement each other given the diversity of genetic drivers of disease. Much of the excitement around gene editing surrounds CRISPR-Cas9 technology, which allows scientists to either slice open DNA at a specific location or substitute individual DNA units one-by-one without altering the entire strand. CRISPR-Cas9 editing has already been deemed to potentially address two/thirds of the more than 50,000 genetic diseases caused by a single gene.10 Other methods of gene editing involve another type of enzyme known as Zinc Finger Nucleases (ZFNs). While there are risks to both approaches, such as causing mutations in unintended locations, gene editing methods are improving.11 The first human CRISPR trial in the West just began in early 2019 to address a rare blood disorder, beta thalassemia. Similar efforts are anticipated to begin this year for other diseases like sickle cell anemia, both in the United States and Europe. The entire healthcare industry will be watching closely to learn from the results of these early clinical trials and how they could potentially speed up opportunities to treat those afflicted with genetic disorders. Estimates suggest the gene editing market should reach $7.5 billion by 2024, up from $3.0 billion in 2017 with a CAGR of 14.5%.12 This number is expected to grow significantly if the treatment methods tested in clinical trials receive positive results and regulatory approval. Biotechnology: Given the foundational role of genes in human biology, there are many synergistic opportunities with other parts of the biotechnology industry. Stem cell research and regenerative medicine, combined with advances in genomics, could help improve the effectiveness of tissue and organ transplants, for example. Such work could also improve our understanding of aging by collaborating with telomere research. In any case, genomics companies are likely to operate in a broad biotechnology ecosystem with many external partners to conduct the best research, produce the most innovative treatments and usher in an era of personalized medicine. The rise of genomics and precision medicine are expected to fundamentally change how health care is understood and delivered. Human biology’s rapid convergence with big data, advanced analytics and scalable computing power should offer unprecedented insight into how diseases of all kinds afflict mankind, and even more importantly, how they may be prevented. From the use of new therapies to altering our own DNA, genomics’ far-reaching potential to transform health care creates a compelling thematic investing opportunity. 1. Allied Market Research, “DNA Sequencing Market: Opportunities and Forecasts, 2018-2025,” Dec 2018. 2. Elysium Health, “The Non-Scientist’s Guide to Genetic Testing,” May 22, 2018. 3. Scientific American, “Tiny Genetic Differences between Humans and Other Primates Pervade the Genome,” Sep 1, 2014. 4. Elysium Health, “The Non-Scientist’s Guide to Genetic Testing,” May 22, 2018. 5. Nature, “Are whole-exome and whole-genome sequencing approaches cost effective? A systematic review of the literature,” 2018. 6. Genohub, “Whole Genome Sequencing (WGS) vs. Whole Exome Sequencing (NYSE:WES),” Feb 21, 2015. 7. Veritas Genetics, “myGenome,” 2019. 8. Mordor Intelligence, “Computational Biology Market – Growth, Trends, and Forecasts (2019-2024),” Feb 2019. 9. Allied Market Research, “Gene Therapy Market,” Feb 2018. 10. WIRED, “Gene Editing is Trickier Than Expected—but Fixes Are in Sight,” Feb 28, 2019. 12. Global Market Insights, “Global Gene Editing Market,” Jan 2019. Investing involves risk, including the possible loss of principal. The investable universe of companies in which GNOM may invest may be limited. The Fund invests in securities of companies engaged in Genomics, Healthcare and Biotechnology sectors. These sectors can be affected by government regulations, rapid product obsolescence, intense industry competition and loss or impairment of patents or intellectual property rights. International investments may involve risk of capital loss from unfavorable fluctuation in currency values, from differences in generally accepted accounting principles or from social, economic or political instability in other nations. GNOM is non-diversified. Carefully consider the Funds’ investment objectives, risk factors, charges and expenses before investing. This and additional information can be found in the Funds’ full or summary prospectus, which may be obtained by calling 1-888-GX-FUND-1 (1.888.493.8631), or by visiting globalxfunds.com. Read the prospectus carefully before investing.